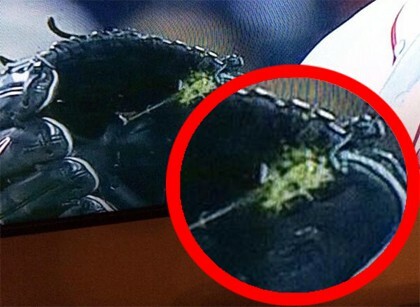 Is Red Sox pitcher Jon Lester rubbing his left index finger on an illegal substance on the inside of his glove during Game 1 of the World Series? In the photo above, it appears that there is some sort of substance in the starter’s glove. It could very well be nothing, however. Here is a slow motion GIF @CorkGaines put together of Lester appearing to touch the spot inside his glove before pitching. Adding to the conspiracy theory is the GIF below, showing Lester reaching up to adjust his cap. As you can see, he does not touch his hat with his index finger. Is it because there’s something on that finger, or at this point are we just trying to see something that’s not there?